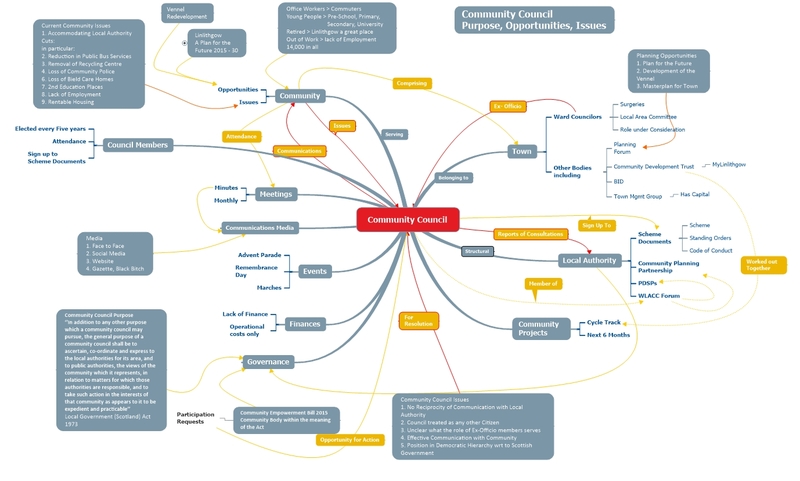 As a member of the Linlithgow and Linlithgow Bridge Community Council I have tried to set out what I see as our role in the following Mind Map. Double click map to bring up as full screen. I welcome comments from other Community Councillors in Scotland and the UK more generally. BTW Linlithgow is a lovely place between Edinburgh and Glasgow from where you can visit Edinburgh and Stirling Castles. And we are only 20 kms from Edinburgh Airport. John Kampfner in a recent European rings with a great deal of truth for me. I went to the Annual Gathering of PD last evening 26/02/19. PD has been going for 10 years. Why have I not come across them before, why indeed did I get an invite. I am glad I did. The right for you and me to get a hearing when Builders appeal to the Government that their application has been refused by the Council. Tail Thought from Clare Symonds. All aspects of planning are a long haul and endlessly tiring. I’m sure John Kelly would agree! PS I do wonder how we finished up with such attractive places as York, Chester and Edinburgh before Planning existed! In a previous blog I reported on going to hear the Scottish Ensemble playing music with a political context. Yet again the question has been raised as to whether music tuition should be free in Scottish Schools. The musical flash mob yesterday before the Midlothian Council Offices changed the councillors’ decision to keep free music tuition in the curriculum. Applause all round: Democracy triumphs. True, but someone else suffers. Budgets are limited from many causes and it is unhelpful in my view to point fingers. One can only hope that Brexit will not make money scarcer still in this country. West Lothian I believe has come to as sensible compromise on music tuition with annual fees for those who want to learn to play for those whose parents can and free for those who can’t; but even here I understand that the number of pupils wanting to continue to play has gone down this year. And I wonder can the West Lothian Council hold its compromise. Will what’s happened in Midlothian affect West Lothian’s decision? It seems to me that there has to be much more open discussion about priorities on spending in Linlithgow and the Community Council has a central role here supported by its Ward Councillors and the Community Development Trust should be involved. Music, Buses, Recycling, you name it, its there. But of course, Linlithgow and Linlithgow Bridge is not an island; we are part of West Lothian as a whole and any such discussion on priorities needs to encompass the whole Authority. West Lothian Council will say that they involved the whole community in the last Budget Round; but I sat through the Council Meeting where the budget and cuts were discussed and seemly random dictates were instructed to council officers: cuts or no cuts to music teaching, how many recycling centres should go; which village halls should seek cash through the Community Empowerment Bill; only this week the Link Linlithgow budget is to be reduced. I believe we must do better. and Community Councils are central here. I have no ready solution, but our communities must be much more closely integrated into the budgeting process so, at least, they understand that money is ‘limited’, and they understand why their preferred groups has less funds from the central pot than last year. But back to our concert; you may like Gabriela Montero, a Venezuelan talking about her piece ‘Babel’ and how her country is being ripped apart by political strife and how she considers that music is essential to continued humanity in her country Venezuela. Thank heavens we in Scotland ar not in this political turmoil . Having played her new piece supported strongly by the strings of the Scottish Ensemble, at the applause, she pulled a Venezuelan flag out and this brought the house down. OK I’m sticking up for continued good music in Scotland and Montero’s will underpin why, there are many other deserving groups, Linlithgow Link is one such and I believe that our Community Council need to take a much more active part along with the Linlithgow Community Development Trust in working towards a better understand of where the balance in priorities should be in our Town. Last night, the Scottish Chamber Orchestra (SCO) performed a 60th Birthday concert for James MacMillan: MacMillan conducting two of his pieces Veni, Veni, Emmanuel and Seven Last Words from the Cross. There was also a short introductory piece by Part. The Seven Last Words from the Cross (1992) was a choral piece and was well done, the SCO Choir gave their best, but I’m not a fan of Choral Works. But the Veni, Veni, Emmanuel was something out of this world. Colin Currie was stupendous on percussion. Playing everything from snare drums, foot drum, xylophone, vibraphone, dancing everywhere. Excellent backing from the SCO. MacMillan used every possible woodwind instrument and even the strings to provide a deep sound. What MacMillan has done is to completely integrate modern / jazz with percussion into the classical symphony repertoire. But in another way, in his Cumnock Tryst, he has brought classical music to the people of Scotland. He established his tryst in Cumnock, an old mining town in Ayrshire, some five years ago and brought a new life to it. OK, just four days a year in the Autumn but the local musicians practice the whole year for the event: He involves the whole town. Last year, the theme was the First World War and to me the centre piece was ‘All the hills and vales alone’ (https://www.thecumnocktryst.com/all-the-hills-and-vales-along) using a forgotten poem by a forgotten Scottish poet Charles Hamilton Sorley. MacMillan brought in singers such as Ian Bostridge, but the choir was local, and the orchestra was the Dalmellington Brass Band backed by the Scottish Ensemble. He was taking the piece on to London where they would use the London Symphony Orchestra. If we want, in West Lothian, to see what Modern Classical Music can do for our Core Development Towns then we could persuade MacMillan and Currie to give Veni, Veni, Emmanuel in Livingston with the orchestra being one of its many brass bands: he has the skills to transpose the music to brass band as demonstrated with ‘All the hills and vales alone’. Sorry, I may sound pejorative but I’m not. One has only to think of perhaps the greatest symphony of all, Shostakovich’s Symphony No. 7 played first (almost) to a packed audience in bombed out and besieged Leningrad in 1942. Free Music Tuition for Schools is a ‘hot potato’ in Scotland , butget’s are short and tuition fees are an easy target. West Lothian has come to a reasonable compromise with the those that can pay do pay and those that can’t go free. But people get a kick out of music, and Veni, Veni, Emmanuel is just one that could bring the whole community together, rather than ‘Them and Us’. The Concert last night at the Queens Hall was filled with the ‘Usual Suspects’ but there were at least 20 children near the back. We have just been to a concert given by the Scottish string orchestra, the Scottish Ensemble. The programme was called Babel after a new composition by Gabriela Montero and focused on the interplay between Music and Politics. The music covered the modern period from Shostakovich, Glass, Vasks, and finished with Messiaen ‘Quartet for the End of Time’. Messiaen wrote it while a prisoner in a German war camp and played it at a camp ‘concert’; the piece this evening was transcribed just for violin and piano; the violin, played by Jonathan Morton leader, sang out piercingly above the piano, played by Montero and you could hear the proverbial pin drop. Written I understand for cello, violin, piano and clarinet certainly didn’t suffer for the transcription. The Shostakovich was his Chamber Symphony written after the death of Stalin and a lot freer because of it ; while the Philip Glass featured two violins first in dissonance but finishing in harmony but backed by the full strings. The Vasks in contrast brought in the Environment and very much the personal. But the centre piece was written and played by Gabriela Montero called ‘Babel’ and the music centred around political unrest in Venezuela. Montero is Venezuelan and present-day Venezuela hurts her, and this piece of music was written before the latest turbulent event. The piece is for piano with Montero playing piano and for strings, the Scottish Ensemble being a string orchestra made the most of it; hurt mixed with laughter. The Scottish Ensemble wins hands down of all the orchestras we go to. They act as one and clearly enjoy playing together, as they did this evening. A lot of this night’s music was painful, the Messiaen in particular, while the Vasks piece had a serenity and the Glass had a rhythm and repetition that mirrors the modern world. We were asked to hold off clapping till the end but when the end came the applause was overwhelming. This was enhanced by Gabriela Montero pulling out of dress a Venezuelan Flag and bowing; the audience was cheered.